A depiction o Tasso frae a German encyclopedia, 1905. Note the laurel croun. 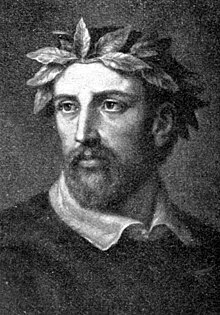 Torquato Tasso (Italian: [torˈkwaːto ˈtasso]; 11 Mairch 1544 – 25 Aprile 1595) wis an Italian poet o the 16t century, best kent for his poem La Gerusalemme liberata (Jerusalem Delivered, 1581), in which he depicts a heichly imaginative version o the combats atween Christians an Muslims at the end o the First Crusade, during the siege o Jerusalem. He suffered frae mental illness an died a few days afore he wis due tae be crouned as the keeng o poets by the Pape. Till the beginnin o the 20t century, Tasso remained ane o the maist widely read poets in Europe. This page wis last eeditit on 21 September 2016, at 00:54.